Featuring the new single "Hard Case"
Mastered from the original analog tapes by Kevin Gray at Cohearent Audio! Signs was recorded at Derek Trucks and Susan Tedeschi's home studio, Swamp Raga, on 2-inch analog tape giving it a warmth and richness that recalls the ambience of the best vintage recordings. Vinyl mastering and lacquers were cut from the analog master tape and pressed on 180-gram black vinyl for highest sound quality. Vinyl mastering and lacquers cut from the analog master tapes by Kevin Gray at Cohearent Audio. 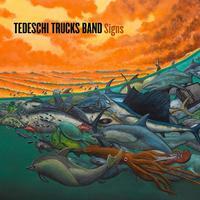 "Signs, the fourth studio album by the Tedeschi Trucks Band, poignantly addresses some of the major changes this 12-piece group has been through over the last couple of years. That said, it's hardly steeped in sadness, but acknowledges reckoning and acceptance while leaning on hope. In November 2016, longtime friend Leon Russell died. In January, Derek's uncle Butch Trucks committed suicide. In May, mentor Col. Bruce Hampton (to whom Signs is dedicated) suffered a fatal coronary on-stage during his 70th birthday celebration (which Trucks and Tedeschi witnessed). The same month, Gregg Allman died after a years-long battle with liver cancer. And in June, keyboardist Kofi Burbridge suffered a heart attack that required emergency surgery. "These events had an obvious impact on Signs, but it results in their most musically diverse offering yet. Sonically it remains in the band's trademark stew of blues, soul, rock, gospel, and improv, but also showcases a new songwriting sophistication and arranging skills. Co-produced by Trucks, Jim Scott, and Bobby Tis, these 11 tracks engage the full power of TTB beginning with the souled- out opener 'Signs, High Times' that places all four singers (Tedeschi, Mike Mattison, Alecia Chakour, and Mark Rivers) alternating up front in a call to rise above the swamp of self-pity. Burbridge's Wurlitzer is distorted and funky, and the horns blare in support as frontline players trade lines across a deep groove.